Billionaire Jeff Bezos said Thursday his commercial space company Blue Origin is planning to perform another test launch from the company’s West Texas facility in early October. According to Bezos, this launch will feature an “in-flight escape test” involving the New Shephard space craft’s crew capsule. “We’ll intentionally trigger an escape in flight and at the most stressing condition: maximum dynamic pressure through transonic velocities,” he said. 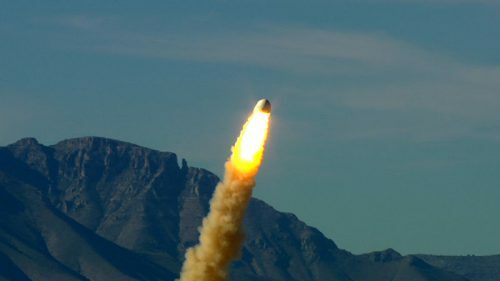 This test will mark the fifth time Blue Origin has reused a single rocket booster, a new technology the company has focused much of its developmental efforts on. But, Bezos said, this next test will “probably destroy” that rocket, and it’s likely it won’t be able to be used again. There’s not set date for the test yet, but the company hopes to blast off from Culberson County in early October. Bezos said this flight will be live-streamed online again, as the company’s last test in June was. This entry was posted in KRTS News and tagged Blue Origin, Commercial Space Industry, Culberson County, Jeff Bezos, Space, Space Flight. Bookmark the permalink.